I attended M.A.C’s always-fabulous trends presentation this week, coming home with loads of top secret information about some seriously cool new product releases, as well as a swag of new goodies to play with. All terribly exciting, and – as always – I felt like a kid in a candy store! One product that was in my bag that I can talk about is Prep + Prime Highlighter (pictured), a key element in the range of the same name that the pros are seriously obsessed by. It came out a little while back and has been a runaway – and runway - hit, but only now have I managed to get my grubby little mitts on one and I LOVE IT. Bright Forecast is the one I’ve been using, and is a soft peach with subtle orange tones. 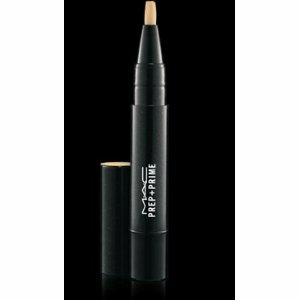 The peachy tones of this shade are good for brightening and lightening dark under eye circles without creating the green cast that many yellow-based correctors can cause, and it’s incredibly foolproof. It effectively minimizes my dark under eye circles – genetic due to my heritage and inevitable due to having a toddler! - while still looking super natural. Light Boost is a pale beige-y yellow, and would work well I think as a cheek or brow highlighter if your skin has yellow undertones. Radiant Rose is a soft, pale pastel pink and can also be used to brighten the under eye area if your circles aren’t as pronounced as mine. I haven’t tried it myself but think it would be a great eye shadow base as it’s a sheer wash that still evens out tone.